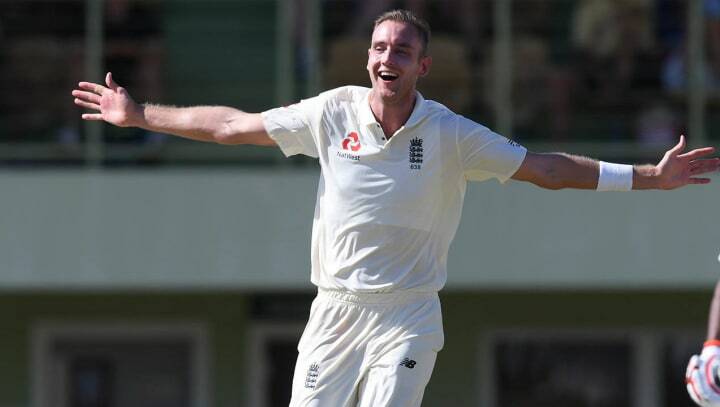 A sleepy Barbados afternoon at a sparsely populated 3Ws Oval isn’t the most high-profile setting for a hat-trick, but yesterday’s three-in-three put Stuart Broad in the mood to make history. The Nottinghamshire fast bowler has achieved the rare feat on two occasions in Test cricket to date, against India at Trent Bridge in 2011 and versus Sri Lanka and Headingley in 2014. Only three other cricketers in Test history have taken hat-tricks on two occasions. Pakistani world-beater Wasim Akram is the only other bowler to do so since 1912. If Broad, who also has a T20 international hat-trick to his name, manages one more with the red-ball – he’ll be out on his own. “An aim of mine is that I would love to get three Test Match hat-tricks,” he said. “I don’t think anyone has ever done it. “I’m on a list with Wasim Akram and a few others of those who got two, but I would love to get three. Maybe this is just good practice. As for skittling the West Indies President’s XI on a day when the tourists took 19 wickets, the 32-year-old sees that as good practice, in every respect. “It’s a shame it wasn’t a Test Match,” he said. “The important thing for me today was the rhythm of the new run-up, with a slightly shorter delivery stride and hitting the crease hard, feeling good. “The first spell was about getting used to being out in the middle again. The second, I tried to ramp it up with more intensity - and the overs I bowled in the afternoon were as good as I’ve felt for a long time. “The ball was swinging away lovely from the right-hander and I was hitting some good lengths, on a pitch that was quite useful to bowl on. “It’s all about the rhythm of bowling, getting used to spending 90 overs in the field and putting overs in the legs. “It’s always nice for the confidence to pick up wickets, but it’s about how you bowl – and before the wickets I was already encouraged with the plays and misses because that meant my action was in a good place. England took 19 wickets for 203 runs as they bowled throughout the second day of their first warm-up fixture since landing in the Caribbean. The opposition featured six players with Test experience too. A more than satisfactory day, as far as Broad is concerned. “It was quite a ruthless performance,” he said. “It’s very easy in warm-up games to take your foot off the gas when you’ve already got wickets. “But we continued to hunt for them, which is a really good habit to get into as a team. “Our fielding was sharp, with a lot of diving stops and good catches, and that’s something we want to continue into the Test series.